View an online demo and request a live demo on your computer to assure that BCSS is right for you before your purchase. Speak with a person: 888-427-5779. Print agreements, labels, tags, receipts, reports and checks with an ink printer. Auto discount aged inventory. Barcodes, cash drawers, receipt printers, QuickBooks. Deluxe plus first-rate thermal labels and tags, network computers, buyer records, employee management, mall space rental. Intro ($295) is POS software program with a training panel - great for procedural reminders and training. Print price labels and hang tags (no barcodes), agreements, receipts, settlements and checks using an ink printer. Inventory is only entered at the point of sale so no records or discounting of unsold inventory - fine for simple POS. In recent years software vendors have attempted to push 'software as a service' as justification for collecting ongoing never-ending monthly or annual payments for using their software. Grand for their profits. Not so much for consigning store owners. Web-Based Software resides on a remote 'server' (computer) and is controlled by the software provider and/or the web-hosting provider. The computer program stops working when payment stops or when your Internet, the Internet itself or the host's connection to the WWW fails. Computer-Based Software is installed on shop computers and can also be shut down if fees aren't paid. Heads up! There are consequences to not paying the 'optional annual support fee': 1) Support will be denied and 2) if that doesn't do it, (critical) software system updates will be withheld. Said another way, no issue with the software will be remedied until the annual fee is collected, or the charge will be inflated for those who didn't enroll in the 'annual service plan'. Leased Software in just another version of stunning attempts to collect forever. The #1 simple and easy allin1 solution is Best Consignment Shop Software. One outlay for lifetime use with no monthly or annual costs - optional or otherwise. Splendid! Ask about quality software packages, specials, discounts, financing and lease purchases. BCSS is several programs rolled into one software: consignment, resale (buy outright), retail and floor-space rental. Within those types of businesses there's inventory, customer and employee management, POS (point of sale), settlement and payment processing, printing, accounting and reporting. In 2001 we examined the layouts of competing programs to improve upon usability with the thought in mind that an intuitive build would increase comprehension and reduce learning/training time. With that in mind all common tasks and essential pieces of information were brought to the surface of the user interface so in switching from clients to inventory to sales all information and tasks would be within a key press or mouse click. The Percentage Tool can change the consignor percent for 1) all client records or 2) all unsold or unsettled items a) for all or b) for one consignor. This 'tool' has been a great time saver for many a shop owner. Inventory for consignment, buy outright and retail can be batch entered, edited, deleted or moved to storage. Settlements can be processed individually or in batch. Multiple checks can be printed. Data can be imported from spreadsheets to save time on data entry. Data can be exported for use in other programs for mass emailing. For each client a different percent can be assigned when creating or editing a client record. Each inventory item can have a unique Consignor %. Each inventory category can have a designated percentage. There can be more than one Discount Schedule. Periodic aged discounts can be granted manually. Each category of inventory can have a schedule assigned. Sales Promotion: One or more categories can be discounted by percent or dollar amount during a stipulated period of time. Prices can be manually adjusted at POS. Any item or invoice (at point of sale) can be discounted by % or $ amount. Items may be entered singularly or in batch. Things entered in spreadsheets can be imported. An agreement may be printed for sellers' signatures verifying items purchased, legal ownership and prices paid. Price labels and tags can be printed with the selling price (only). The program will compute profit/loss for each item. Reports can be created for any period of time, per category, for buy-outright items only, per client, etc. Retail differs from buy outright in that merchandise is purchased 'B2B' (business to business) so purchases are made from wholesalers, manufacturers, suppliers, craftsmen, importers, etc. Antique and shopping malls manage units of floor space. Trade shows, events and exhibitions rent display units. Flea and farmers markets track booths. The program keeps track of dealers (renters), the amounts of rent, dates due as well as those waiting for specific rental units. Mall or market managers have the options or printing price labels and tags for vendor products and processing sales for vendors. With the Virtual edition of the software occupants can view their account information and add inventory online. For every rent period a report is available for renters whose sales were short of covering rent. Two default tax rates can be set where state and local taxes are to be collected. A different rate can be set for each category or each item. An entire invoice can be made non-taxable. Resellers with valid tax IDs can purchase tax free. Any credit-card processor may be used including Square and PayPal. The program is not integrated with any processing service. The sales clerk only needs to select the method of payment and process the card transaction completely independent of the software. Multiple invoices can be opened at the same time, allowing a shopper to put a sale on hold and come back to complete the sale later on. Price labels and hang tags can be printed with any edition of the program using a standard black/white ink printer and sheet stock. With Diamond and Virtual editions labels and tags can be printed from rolls of thermal labels using a thermal label printer. Cash drawers (with locks and keys) connect to receipt printers and pop open when a receipt prints. Stores selling used merchandise often have no-return policies making the printing of receipts unnecessary so with BCSS, a drawer can be connected directly to the computer (with a special adapter replacing the printer) and will only open for non-credit-card transactions (like cash, check, store credit, etc). In the absence of a receipt printer, receipts can be printed from within the program using an ink printer. Receipt printers print receipts on 3-inch-wide thermal roll paper (available for most office-supply stores). POS-X is a hardware manufacturer supplying drawers and receipt printers to be used with BCSS. Other drawers and receipt printers (Epson, Star) are known to work with the program but are not recommended or supported. Install Best Consignment Shop Software on a laptop computer and take it with you. Place the program on a shop computer and use any free remote-pc software to access the shop PC. Shut it down when you're done. Web-based software is not controlled by the end user. It is installed on a computer whose location and owner are basically unknown. Cloud software adds dependencies upon your Internet connection, the Internet itself and the web host's Internet connection. Connections to the WWW invite viral infections. If the computer is not connected to the Internet, there is no risk. Clients' data is placed 'out there' on the web and vulnerable despite any guarantees to the contrary. There are plans in place to increase the amount of money flowing from stores to software companies based upon usage: the number of users, the amount of activity, the extent of features and the number of locations. The strategy should be very clear. Web software users have reported that those in control of their data have refused to release their data when requested, regardless of the fact that the data belongs to the store owner. Installing software on your computer keeps you in control of risk, the data and cost. Most stores operate quite efficiently with the Deluxe edition of Best Consignment Shop Software at $395 with no trailing fees. Compare that to a minimum of $100 per month every month for 10 years: $12,000. What Is A Consignment Program? 'Program' often refers to a software application alone but an entire 'program' for running a store selling second-hand merchandise (as well as retail stock) could encompass a complete system including computers, software, hardware, service and supplies, or even a franchise. A franchise is impractical for most consignment businesses simply because there isn't enough profit margin in the sale of used goods to be split between 3 parties: consignor, franchiser and shop owner. The latter might save some time and effort in establishing his or her own store but the long-term sharing of profits doesn't offset the expense of a permanent (silent) business partner whose mains contributions may have only been a business model, equipment and setup. 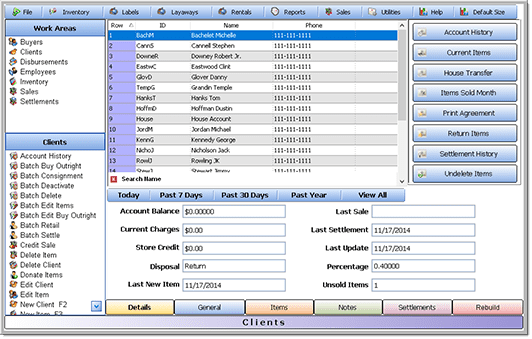 The most common configuration of a consignment program as a complete system is a software app provided by an application developer who might also sell and deliver PCs and peripherals (barcode scanners, cash drawers, receipt and label printers in addition to installing peripheral 'drivers' (software) and providing follow-up training and support. Credit-card processing is included in some 'package deals' with 2 inherent problems: 1) By integrating card services with software, the software developer gets a kickback of every sale from the services provider who gets it from the shop owner (higher rates) and 2) integrated processing locks the business owner into the service subjects him or her to rate increases without the ability to opt out. Consideration of any consignment program as a system should include a full written disclosure by the provider of any and all possible fees and policies for increasing future costs. Any purveyor refusing to disclose costs may have something to hide and should be avoided. What Is Consignment Sale Software? Used as a noun 'sale' means an event at which (generally) used merchandise will be offered for sale to the public. Sales are commonly hosted by churches, organizations, charities and those in the business of conducting a periodic sale for 'seasons' of the year. If the sponsor is selling merchandise belonging to others, the sale is a consignment event. If the sponsor is reselling merchandise purchased elsewhere, it's known as 'resale' for things purchased from individuals and 'retail' for items acquired from other businesses. The main challenges of the sale's purveyor are keeping track of clients and their goods, and distributing sales proceeds and unsold goods. Historically software vendors who targeted this market charged a fee for every event and added back-end costs by placing limits on the number of clients or inventory items or transactions before forcing end users to pay more. This type of software might be more appropriately dubbed as POS Selling Software to define the act of handing over ownership of products to another in exchange for something of value at the 'point of sale'. Seasonal software almost always includes POS software but not vice versa. Most apps for consignment and resale include POS functionality and typically the common features are included like discounting (by % or $ amount), discounting per item or per invoice, selling tax free, variable sales-tax rates perhaps by category, payment methods and layaways. The costs of selling online have increased as the opportunities for profit have shrunk, reverting resellers of used merchandise to less-costly and more efffective methods of creating profits from sales. Expenses include a software program and an 'e-commerce shopping cart' (like Shopify), both of which impose fixed and ongoing charges. 'Consignment Software Shopify' may not be the most profitable road to future profits. What is the best consignment software? By definition, the 'best software' is the program that reliably automates business processes at the least cost with ease and security. Since our inception in 2001 Best Consignment Shop Software has provided software, hardware and service to 4,000+ shop owners before, during and after hours, on weekends and during holidays. We continue to maintain open lines of communication with clients by email, text, chat, messaging and phone, including a toll-free number for sales as well as support. We extend beyond the boundaries of our software and hardware, providing cost-saving recommendations on other programs, computers and equipment, training in other applications and suggestions for helpful resources like free advertising, labels and business management. The program itself stands on a reliable platform provided by Microsoft and has been updated frequently at no additional cost to its users. Dependable computers, software and peripherals condense labor-intensive processes into time-saving simple procedures. Press a button to view an accurate report (that would take hours to compile with possible mistakes). Click on a link to print price labels and hang tags (which would take considerable time by hand). Process sales in a matter of seconds and shrink the task of paying consignors at month's end from hours to minutes. Of course PCs, applications and the things that go with them are 'tools' which require learning how to use them. There are two prices to pay: 1) the cost of learning and 2) the cost of not learning. It is said that we use only 10% of our brains. The same could be said for the extent to which we utilize the capabilities of the things connected to our keyboards and mice. Liken computers and all things IT like a new car - the more we take time to learn about features and use them (correctly), the more useful they become, saving us money, increasing our appreciation for the added conveniences and productivity, and making us less dependent upon others which in turn gives us a sense of accomplishment. Fully many a shop owner runs her or his business without assistance because she or he has made the effort to master skills. Why pay $5,000 and more (over time) for a program when one for a tenth of that will get the job done? Confusion - There are too many choices. Sales Hype - Every offering is 'the best'. Deception - Software vendors camouflage costs. Malfeasance - Vendors attack competitors. Whom to believe? Is there a monthly or annual support plan? What are the consequences of not paying the monthly or annual fee? Do you have 'emergency rates' (before/after hours, weekends, holiday)? On how many computers can the software be used? What is the cost of additional copies or users? Do I own the software? If I pay monthly rent, can you raise the amount later on? Does your marketing strategy include disparagement of competitors? When it comes to computers, most of us hope for the best and don't plan for the worst. Protecting ourselves from malware, hackers, errors, electricity and bad luck should be the first things we do and most of us would if only we would accept the very high probability that bad things are a common every-day occurrence when bringing computers into our places of business. How do I enter consignment in Quickbooks? QuickBooks of course does not know about consignment in that it is not designed to easily manage a consignment business. Select New Purchase Order from the purchasing menu. Select the seller from the vendor menu. Chose a consignment from the enter-items menu. Enter quantity in the ordered field. Select new item from inventory. Choose the seller from the list of vendors. Choose the item from the enter-items menu. The instructions go on from there, demonstarting that the program is not the best way to go about managing a consignment shop. An accounting program like Qbooks makes it possible to combine data from multiple locations under one company account. The consolidation simplifies tax reporting and computation of more sophisticated reports like balance sheets and profit/loss statements. The word 'free' is very high on the list of words used on the Internet to attract attention, appealing of course to our desire to cash in on free offers and save money by acquiring goods and services at no cost, but what are the costs, really? Most commonly software vendors try to horn in on 'free' by coupling the term with software demos, i.e. "free software demo!". 'Free' last for a short period of time and of course the intent is to get the software user accustomed to using the program and reluctant to start all over with something else. The 'cost' is all the money that will be paid in the future, not only for the software but for service, updates, upgrades, copies, future increases in fees, et. al. One vendor flags Internet searches down with a search-engine title of simply 'Free Consignment Software' ask rehetorically, "What is This Free POS Software?" and those clicking through find the 'but' near the bottom of the page, "but commercial support, training, and customization is available from the author" which requires more hunting to finally find the 'gotcha': "...there is absolutely no free support (no free installation help, no free training, no free troubleshooting, no free coding help, no free general business help, etc.) offered by the author." coupled with "...the author's standard work rate is $50 per hour..."
In reality no person or company in the business of making a profit is going to invest heavily in an application and give it away without deriving some benefit from doing so. For more on the subject see free consignment software. By far the most significant aspect of 'Simpleconsign' is cost. Even the sales hype is geared toward disguising the long-term toll monthly endless fees will take on a store with one location, not to mention the literal devastation of using this software in multiple locations. "You wouldn’t believe the number of people who don’t think about buying software until about 2 weeks before opening. Sometimes they just go with the first software vendor they find or a friend’s recommendation. After shelling out hard-earned money, they find out the software isn’t what they really needed." The software stops when payment stops. How many years do you expect to be in business. Multiply that by (rounded) $1,200, $1,800 or $2,400. 10 Years: $12,000 just for software. Compare that to a one-time cost of $595 for BCSS Diamond. You might not be thinking of multiple locations at the moment so for now, just be aware of the pricing multiple. The fine print: "Customer support and training are available for customers only and will be available after your trial has ended." In contrast a non-web-based program installs on your computer where sensitive data can be protected under your control. The cost is once for lifetime use without the risk of future price increases. You can 'work from home or anywhere' with any software program using any of the free remote-pc programs and there can be more than one 'user'. For most shops the selling points of simpleconsign simply aren't worth the extreme costs and out-of-control risks.